In The Perfect Patchwork Primer every phase of patchwork quiltmaking is covered — choice and handling of fabrics, design, detailed sewing and quilting instruction. 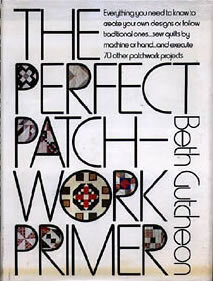 Departing from other quilting books, Beth Gutcheon tells us how to use modern technology to speed the making of patchwork without sacrificing quality. She shows how to adapt traditional patterns and techniques to speedy machine sewing (without affecting the “handmade” appearance) and offers up-to-date information on using new fabrics, silicone-coated quilting thread, dacron batting, and the like.